A flight management system (FMS) is a fundamental component of a modern airliner's avionics. An FMS is a specialized computer system that automates a wide variety of in-flight tasks, reducing the workload on the flight crew to the point that modern civilian aircraft no longer carry flight engineers or navigators. A primary function is in-flight management of the flight plan. Using various sensors (such as GPS and INS often backed up by radio navigation) to determine the aircraft's position, the FMS can guide the aircraft along the flight plan. From the cockpit, the FMS is normally controlled through a Control Display Unit (CDU) which incorporates a small screen and keyboard or touchscreen. The FMS sends the flight plan for display to the Electronic Flight Instrument System (EFIS), Navigation Display (ND), or Multifunction Display (MFD). The FMS can be summarised as being a dual system consisting of the Flight Management Computer (FMC), CDU and a cross talk bus. The modern FMS was introduced on the Boeing 767, though earlier navigation computers did exist. Now, systems similar to FMS exist on aircraft as small as the Cessna 182. In its evolution an FMS has had many different sizes, capabilities and controls. However certain characteristics are common to all FMS. All FMSs contain a navigation database. The navigation database contains the elements from which the flight plan is constructed. These are defined via the ARINC 424 standard. The navigation database (NDB) is normally updated every 28 days, in order to ensure that its contents are current. Each FMS contains only a subset of the ARINC / AIRAC data, relevant to the capabilities of the FMS. Radio navigation aids including distance measuring equipment (DME), VHF omnidirectional range (VOR), non-directional beacons (NDBs) and instrument landing systems (ILSs). The flight plan is generally determined on the ground, before departure either by the pilot for smaller aircraft or a professional dispatcher for airliners. It is entered into the FMS either by typing it in, selecting it from a saved library of common routes (Company Routes) or via an ACARS datalink with the airline dispatch center. During preflight, other information relevant to managing the flight plan is entered. This can include performance information such as gross weight, fuel weight and center of gravity. It will include altitudes including the initial cruise altitude. For aircraft that do not have a GPS, the initial position is also required. The pilot uses the FMS to modify the flight plan in flight for a variety of reasons. Significant engineering design minimizes the keystrokes in order to minimize pilot workload in flight and eliminate any confusing information (Hazardously Misleading Information). 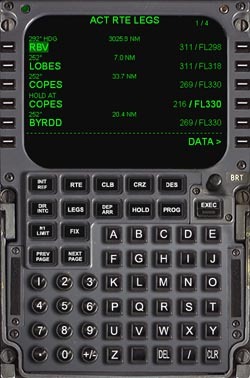 The FMS also sends the flight plan information for display on the Navigation Display (ND) of the flight deck instruments Electronic Flight Instrument System (EFIS). The flight plan generally appears as a magenta line, with other airports, radio aids and waypoints displayed. Special flight plans, often for tactical requirements including search patterns, rendezvous, in-flight refueling tanker orbits, calculated air release points (CARP) for accurate parachute jumps are just a few of the special flight plans some FMS can calculate. Airline-quality GPS receivers act as the primary sensor as they have the highest accuracy and integrity. Scanning DME (distance measuring equipment) that check the distances from five different DME stations simultaneously in order to determine one position every 10 seconds. VORs (VHF omnidirectional radio range) that supply a bearing. With two VOR stations the aircraft position can be determined, but the accuracy is limited. Inertial reference systems (IRS) use ring laser gyros and accelerometers in order to calculate the aircraft position. They are highly accurate and independent of outside sources. Airliners use the weighted average of three independent IRS to determine the “triple mixed IRS” position. The FMS constantly crosschecks the various sensors and determines a single aircraft position and accuracy. The accuracy is described as the Actual Navigation Performance (ANP) a circle that the aircraft can be anywhere within measured as the diameter in nautical miles. Modern airspace has a set required navigation performance (RNP). The aircraft must have its ANP less than its RNP in order to operate in certain high-level airspace. Given the flight plan and the aircraft's position, the FMS calculates the course to follow. The pilot can follow this course manually (much like following a VOR radial), or the autopilot can be set to follow the course. The FMS mode is normally called LNAV or Lateral Navigation for the lateral flight plan and VNAV or vertical navigation for the vertical flight plan. VNAV provides speed and pitch or altitude targets and LNAV provides roll steering command to the autopilot. Sophisticated aircraft, generally airliners such as the Airbus A320 or Boeing 737 and other turbofan powered aircraft, have full performance Vertical Navigation (VNAV). The purpose of VNAV is to predict and optimize the vertical path. Guidance includes control of the pitch axis and control of the throttle. In order to have the information necessary to accomplish this, the FMS must have a detailed flight and engine model. With this information, the function can build a predicted vertical path along the lateral flight plan. This detailed flight model is generally only available from the aircraft manufacturer. During pre-flight, the FMS builds the vertical profile. It uses the initial aircraft empty weight, fuel weight, centre of gravity and initial cruise altitude, plus the lateral flight plan. A vertical path starts with a climb to cruise altitude. Some SID waypoints have vertical constraints such as "At or ABOVE 8,000". The climb may use a reduced thrust or "FLEX" climb to save stress on the engines. Each must be considered in the predictions of the vertical profile. Implementation of an accurate VNAV is difficult and expensive, but it pays off in fuel savings primarily in cruise and descent. In cruise, where most of the fuel is burned, there are multiple methods for fuel savings. As an aircraft burns fuel it gets lighter and can cruise higher where it is generally more efficient. Step climbs or cruise climbs facilitate this. VNAV can determine where the step or cruise climbs (where the aircraft drifts up) should occur to minimize fuel consumption. Performance optimization allows the FMS to determine the best or most economical speed to fly in level flight. This is often called the ECON speed. This is based on the cost index, which is entered to give a weighting between speed and fuel efficiency. The cost index is calculated by dividing the per-hour cost of operating the plane by the cost of fuel. Generally a cost index of 999 gives ECON speeds as fast as possible without consideration of fuel and a cost index of zero gives maximum efficiency. ECON mode is the VNAV speed used by most airliners in cruise. RTA or required time of arrival allows the VNAV system to target arrival at a particular waypoint at a defined time. This is often useful for airport arrival slot scheduling. In this case, VNAV regulates the cruise speed or cost index to ensure the RTA is met. The first thing the VNAV calculates for the descent is the top of descent point (TOD). This is the point where an efficient and comfortable descent begins. Normally this will involve an idle descent, but for some aircraft an idle descent is too steep and uncomfortable. The FMS calculates the TOD by “flying” the descent backwards from touchdown through the approach and up to cruise. It does this using the flight plan, the aircraft flight model and descent winds. For airline FMS, this is a very sophisticated and accurate prediction, for simple FMS (on smaller aircraft) it can be determined by a “rule of thumb” such as a 3 degree descent path. From the TOD, the VNAV determines a four-dimensional predicted path. As the VNAV commands the throttles to idle, the aircraft begins its descent along the VNAV path. If either the predicted path is incorrect or the downpath winds different from the predictions, then the aircraft will not perfectly follow the path. The aircraft varies the pitch in order to maintain the path. Since the throttles are at idle this will modulate the speed. Normally the FMS allows the speed to vary within a small band. After this, either the throttles advance (if the aircraft is below path) or the FMS requests speed brakes with a message such as “ADD DRAG” (if the aircraft is above path). An ideal idle descent, also known as a “green descent” uses the minimum fuel, minimizes pollution (both at high altitude and local to the airport) and minimizes local noise. While most modern FMS of large airliners are capable of idle descents, most air traffic control systems cannot handle multiple aircraft each using its own optimum descent path to the airport, at this time. Thus the use of idle descents is minimized by Air Traffic Control. ^ Sam Miller, et als (2009). "Contribution of Flight Systems to Performance-Based Navigation". AERO Magazine (34, Qtr. 2). Retrieved 31 December 2012. ^ Spitzer, Carl (2007). "20.2.1". Avionics, Element, Software and Functions. Boca Raton, FL: CRC Press. pp. 20–6. ISBN 978-0-8493-8438-7. ^ "AERO - Fuel Conservation Strategies: Cost Index Explained". www.boeing.com. Retrieved 2018-12-08. ^ Airbus Industrie SE (May 1998). "Getting to Grips with the Cost Index" (PDF). Cockpitseeker.com. Retrieved 8 September 2018.